Happy Summer everyone! Its definitely hot and sunny down here, we are eating lots of ice cream and trying to stay cool. 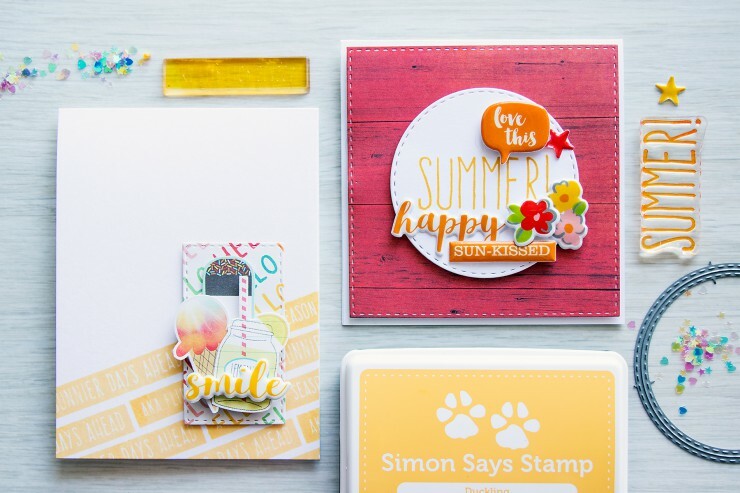 I have two cards to share today using Simon Says stamp August Card Kit. I’ve already shared one more project and a video and you can see it by clicking on this link here. 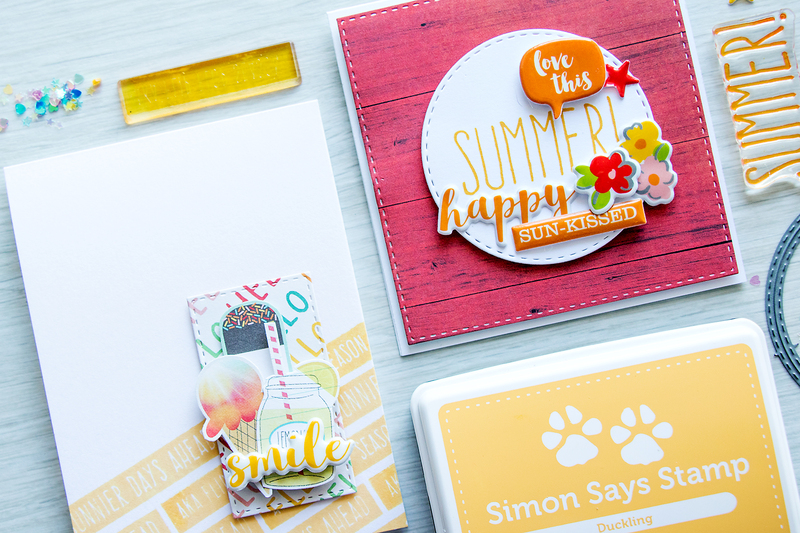 For my Smile card you see on the left I started by stamping “aka flip flop season” and “sunny days ahead” diagonally using Simon Says Stamp Duckling ink. I just love this soft yellow color. I created a partial stamped background, foam mounted a die cut rectangle which I created using Simon’s Stitched rectangles die and added a couple of images on top. 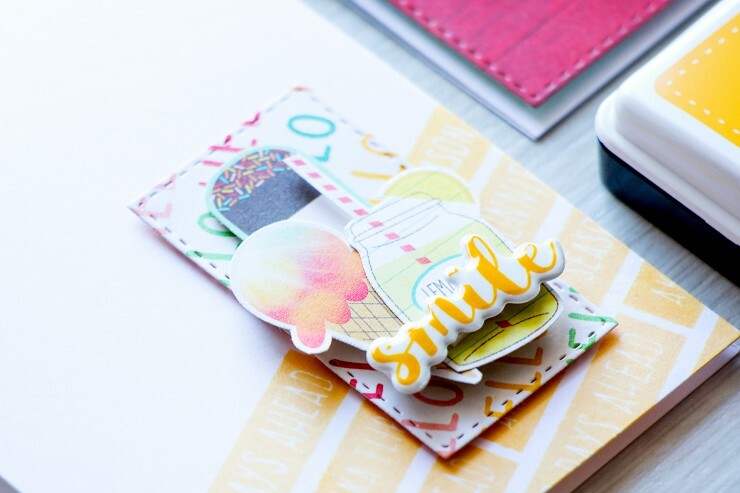 I fussy cut those out of Simple Stories Summer Vibes paper pad that was included in my kit. I also added a fun “smile” puffy sticker on top and that finished my card. 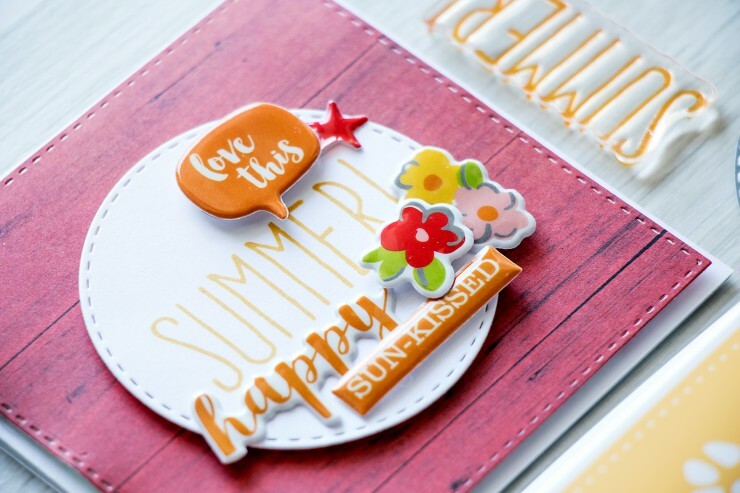 For my second project, a Happy Summer Card I created a 4 1/4 x 4 1/4 square card base and added a die cut square created using Simon’s Stitched Squares dies, I also used foam adhesive to pop it up above my card. I was going for simple shapes here so I also die cut a stitched circle, stamped Summer using Sunshine ink and added several puffy stickers around it. I foam mounted some of them for a more dynamic look. 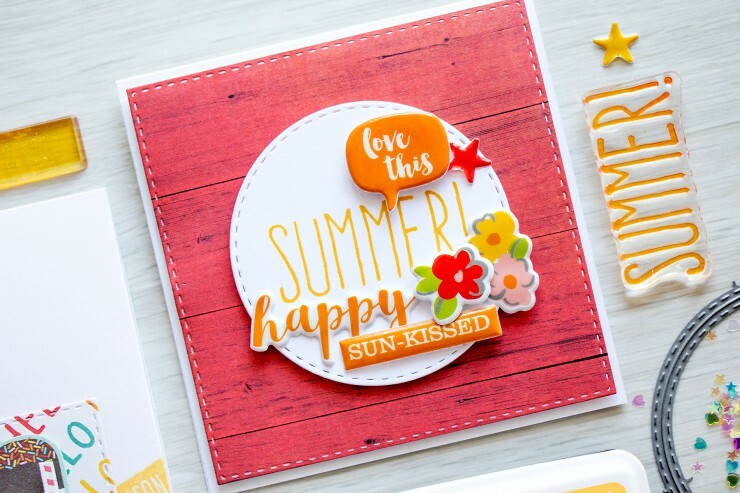 Beautiful summery cards, love these designs! What absolutely beautiful summer card Yana! I love all of the fantastic colors! Both cards are gorgeous! Love diagonal stamping on the first one. And amazing deep background on the second. Both your cards are lovely! So bright and joyful!